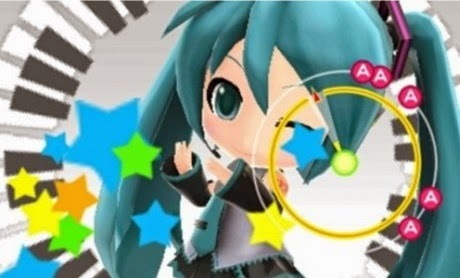 Making it's way to Western 3DS systems for the first time will be Hatsune Miku in Hatsune Miku: Project Mirai Remix. The game has been announced for a 2015 release in North America and Europe. For those wondering, Project Mirai Remix will be an enhanced version of the original game from Japan, Hatsune Miku: Project Mirai 2. There are some features that are unique to this 3DS game for those who played the Project Diva games on Playstation (if not, I did a quick review that I wish I could rewrite about the demo on PS Vita and will review the whole PS3 game eventually). As you can see in the song trailer below, this includes the ability to have vocaloids sing songs that aren't their own original songs. If you played Hatsune Miku: Project Diva F, you'll know that you could switch the visual characters but not the voices, so this feature is an improvement (the feature in Project Diva F didn't make a lot of sense to me). Those who love customising characters will be pleased to know you can customise outfits, the character's rooms and buttons in the game. This ties in with network features where you can show off your character on a character card to other players, along with the option to make your own custom dance routines and more using StreetPass. "We worked closely with our partners in Japan and the artists to ensure that the lyrical intent of the original Japanese is maintained so our non-Japanese speaking fans can better understand the meaning and context of the amazing world of Hatsune Miku." You can watch the trailer and see a preview of some of the songs from Project Diva F 2nd with their English lyric translations below.